Bolton remain perilously close to the relegation zone as David McGoldrick's penalty secured victory for Ipswich. Mark Davies missed for Bolton from 10 yards before Frank Nouble and Aaron Cresswell went close at the other end. Dean Gerken made a sharp stop in the Ipswich goal from Neil Danns before McGoldrick converted from the spot after he had been brought down by Wanderers goalkeeper Andy Lonergan. Bolton have won only one of their last eight games in all competitions. Their only win since Boxing Day was 2-1 against Blackpool at home in the FA Cup on 4 January. Chris Eagles's tame effort was all Bolton could muster in response. Only two late goals for Wigan against Charlton kept the gap between the Trotters and the drop zone at four points as Dougie Freedman's side stretched their recent record to one win in their last eight games in all competitions. The form of both sides coming into the game suggested this was never going to be a classic, with two wins between them in 2014 before this encounter. But the pedestrian pace of the first half in particular belied both teams' eagerness to collect points, whether it be for Ipswich's push for the top six or Bolton's fight against relegation. Wanderers were slightly more expansive in a tame opening 45 minutes, with Middlesbrough loanee Lukas Jutkiewicz causing problems with his strength and height. Davies should have put them in front but sliced wide and Gerken made a great stop as Danns got on to the former's ball into the box. Nouble's deflected effort and a rasping Cresswell drive were all Town had to show for their direct approach in the first half, before a series of Bolton errors early in the second period managed to liven up proceedings. The Wanderers defence had passed up multiple opportunities to clear before Lonergan compounded matters by bringing down McGoldrick when the pair were battling for a loose ball. McGoldrick thumped in his spot-kick to take his tally for the season to 15. It lifted the home crowd and Mick McCarthy's men, with McGoldrick and Stephen Hunt both going close. There was time for substitute Liam Trotter to make his Bolton debut against his hometown and former club, following his deadline day loan move from Millwall. But while Freedman's side saw plenty of the ball late on, they created little against McCarthy's sturdy outfit, who remain four points adrift of the play-off places. "I think that epitomises us. We're not great, we're not silky, we're a belligerent, stubborn, hard working bunch with a really good team spirit. 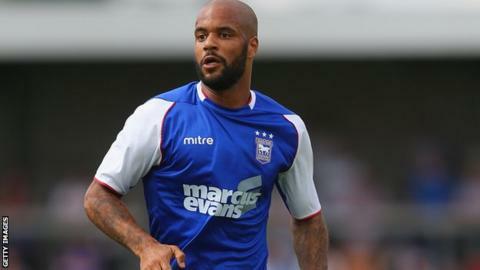 I think David McGoldrick epitomises what we're about, he ran about 60 yards to tackle Eagles at one point and it's his job to stick the ball in the net. "They work for each other and me and the club. But we're not a silky, wonderful football team by any stretch of the imagination. "We didn't do enough in the first half. I said 'we have to step it up lads'. And I think we got the goal out of being a little bit more in their face." "It's a very disappointing result. We felt in the first 45 minutes we were by far the better side - and it happens regularly to us. We competed very well and created two or three opportunities that you'd like to try and take. "A rush of blood in the second half seems to be the difference in the game. These small moments are hurting us badly right now. It's something we have to accept but not let our heads go down too much and not let the performance levels drop. "I have no complaints about the penalty. It's a rush of blood to the head. Andy Lonergan has been fantastic for us and I won't have a blame culture at the football club. We're in a difficult moment right now and we have to stick together." Match ends, Ipswich Town 1, Bolton Wanderers 0. Second Half ends, Ipswich Town 1, Bolton Wanderers 0. Attempt missed. Liam Trotter (Bolton Wanderers) header from the centre of the box misses to the left. Assisted by Lee Chung-Yong with a cross. Foul by Christophe Berra (Ipswich Town). Lukas Jutkiewicz (Bolton Wanderers) wins a free kick in the attacking half. Attempt missed. Stephen Hunt (Ipswich Town) right footed shot from outside the box is too high. Assisted by Stephen Hunt following a set piece situation. Frank Nouble (Ipswich Town) wins a free kick on the left wing. Foul by Alex Baptiste (Bolton Wanderers). Jay Tabb (Ipswich Town) wins a free kick on the right wing. Foul by Lee Chung-Yong (Bolton Wanderers). Attempt missed. Frazer Richardson (Ipswich Town) right footed shot from outside the box is too high. Assisted by Daryl Murphy. Attempt blocked. David McGoldrick (Ipswich Town) right footed shot from outside the box is blocked. Jay Tabb (Ipswich Town) wins a free kick in the attacking half. Foul by Liam Trotter (Bolton Wanderers). Attempt blocked. Christophe Berra (Ipswich Town) right footed shot from outside the box is blocked. Attempt blocked. David McGoldrick (Ipswich Town) left footed shot from outside the box is blocked. Assisted by Dean Gerken. Attempt saved. Chris Eagles (Bolton Wanderers) left footed shot from the centre of the box is saved in the bottom right corner. Assisted by Lukas Jutkiewicz. Attempt missed. David McGoldrick (Ipswich Town) right footed shot from outside the box misses to the right. Attempt blocked. Stephen Hunt (Ipswich Town) left footed shot from outside the box is blocked. Assisted by Daryl Murphy. Offside, Bolton Wanderers. Tim Ream tries a through ball, but Lukas Jutkiewicz is caught offside. Substitution, Bolton Wanderers. Lee Chung-Yong replaces Medo. Substitution, Ipswich Town. Frazer Richardson replaces Anthony Wordsworth. Substitution, Bolton Wanderers. Liam Trotter replaces Neil Danns. Attempt missed. Alex Baptiste (Bolton Wanderers) right footed shot from outside the box is high and wide to the right following a set piece situation. Foul by Jay Tabb (Ipswich Town). Mark Davies (Bolton Wanderers) wins a free kick on the left wing. Foul by Daryl Murphy (Ipswich Town). Andy Lonergan (Bolton Wanderers) wins a free kick in the defensive half. Corner, Ipswich Town. Conceded by Tim Ream. Corner, Ipswich Town. Conceded by Zat Knight. Attempt blocked. Daryl Murphy (Ipswich Town) left footed shot from the left side of the box is blocked. Assisted by David McGoldrick. Frank Nouble (Ipswich Town) wins a free kick in the attacking half. Foul by Jay Spearing (Bolton Wanderers). Attempt blocked. Jay Tabb (Ipswich Town) left footed shot from outside the box is blocked. Assisted by Stephen Hunt. Attempt blocked. Daryl Murphy (Ipswich Town) left footed shot from the centre of the box is blocked. Offside, Bolton Wanderers. Andy Lonergan tries a through ball, but Chris Eagles is caught offside. Attempt saved. Stephen Hunt (Ipswich Town) left footed shot from long range on the left is saved in the centre of the goal. Assisted by David McGoldrick with a headed pass. Corner, Ipswich Town. Conceded by Medo. Substitution, Bolton Wanderers. Chris Eagles replaces Darren Pratley.